Recombinant antibody technology has provided an alternative method to engineer antibody fragments with the desired specificity and affinity within inexpensive and relatively simple host systems. Powerful combinatorial technologies have enabled the development of in vitro immune repertoires and selection methodologies that can be used to derive antibodies with or without the direct immunization of a living host. AbET core provides a comprehensive antibody screening strategy using recombinant proteins, tag fusion proteins, peptide and targeting membrane protein. Human monoclonal antibody discovery by phage display is well established as a robust and reliable source for the generation of antibodies for therapeutics and diagnostics applications. Human naïve antibody libraries are derived from natural, unimmunized, rearranged V genes (e.g., from the IgM B-cell pool). Naïve human phage antibody library is comprised of antibody fragments from a source of genes that is not explicitly biased to contain clones binding to antigens; intrinsically they are useful for selecting antibodies against all possible types of antigen structures. AbET core has constructed human naïve antibody phage display library in single chain fragment variable (scFv) format, with a library having more than 1.2 x 1010 clones that cover the human antibody repertoire. 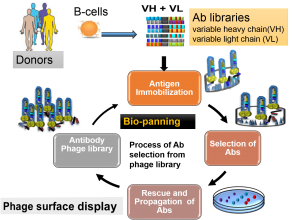 Overview of antibody library production and selections using phage display. The phage antibody library repertoire is derived from the B cells of naïve or immune donors. Bio-panning represents selection of phage coated antibody binders. 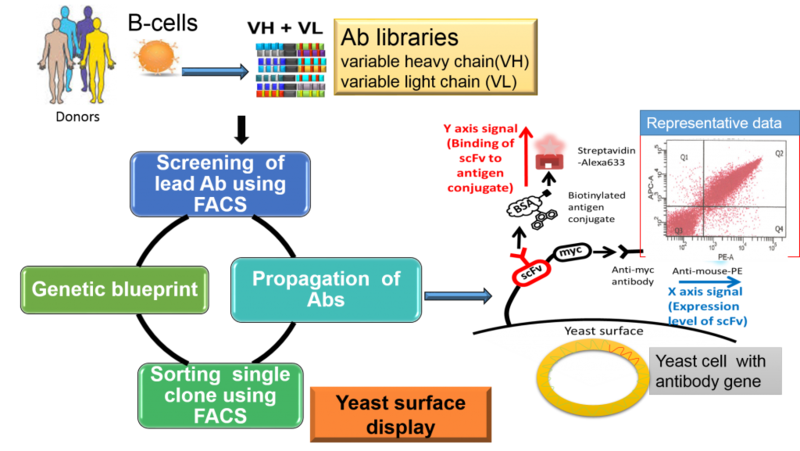 Overview of antibody library production and selections using yeast display. The yeast antibody library repertoire is derived from the B cells of naïve or immune donors. For yeast antibody display, the scFv is displayed as a fusion product with the Saccharomyces Aga2p protein. For yeast display analysis, the expression of scFv was measured by a anti-myc antibody phycoerythrine-labeled anti-mouse antibody (X axis signal). The binding of the scFv to the biotinylated phenanthrene-protein conjugate was measured by streptavidin-Alexa633 fluorescence (Y axis signal). Easy access to sequencing data for required scientific validation. Resulting excellent lot-to-lot consistency means re-validation isnot required. Alternative antibody formats Beause the genetic information encoding the antibody is immediately available, the antibody can immediately be produced in other formats if required, e.g. IgG, scFv-Fc fusion including whole-antibody monoclonal isotypes (IgG, IgA, IgE) compatible with bacterial and other expression systems.